Time for one of my FAVORITE projects in the 4th grade! Starry Night (in Nebraska)! 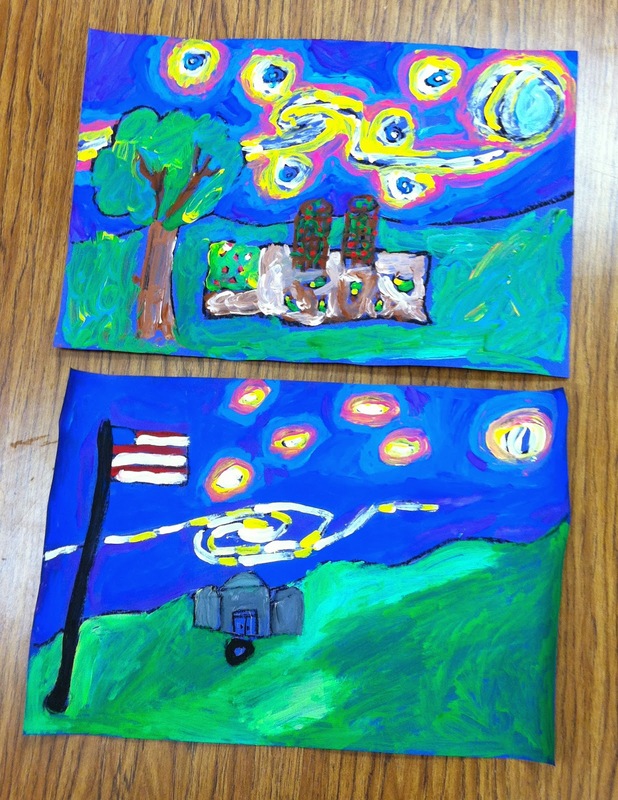 We start this project by looking at the original VanGogh starry night. 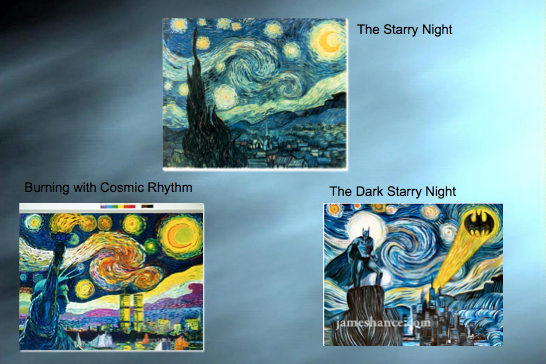 Then we compare this starry night to two similar paintings: Burning with Cosmic Rhythm by T. F. Chen, and The Dark Starry Night by James Hance. 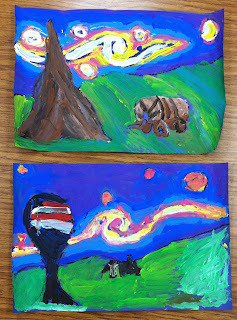 Students discuss the similarities and differences of the three paintings. We talk about how artists use famous works like Starry Night to learn how to paint in different ways and because they are recognizable by a lot of people. We even watched a video by an artist who created starry night out of dominoes! We talked about how the "composition" of all three is the same. They all have tall objects on the left side, a moon on the right, and a smaller object and a city in the center. They all have the swirl of color in the sky as well. But each is a picture of a different location. We talked about what objects might become part of a "Nebraska" composition. Good tall objects were trees, flag poles, windmills, silos, Chimney Rock, our city water tower, etc. Then we talked about what small landmark could take the place of the center. After we drew our pictures, we painted in an impressionist style so you could see our brush strokes like the style of Vincent VanGogh! Top: A student's backyard with a tree and tomato towers in the garden. Bottom: A flagpole and our school building. Top: Nebraska State Capital building and Memorial stadium (home of the Huskers!). 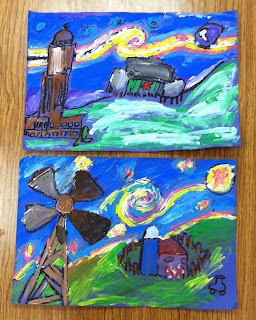 Bottom: A windmill and barn with a silo on a farm. Top: Chimney Rock and a covered wagon on the prarie. Bottom: City water tower and the school building. Elf Yourself at the North Pole!